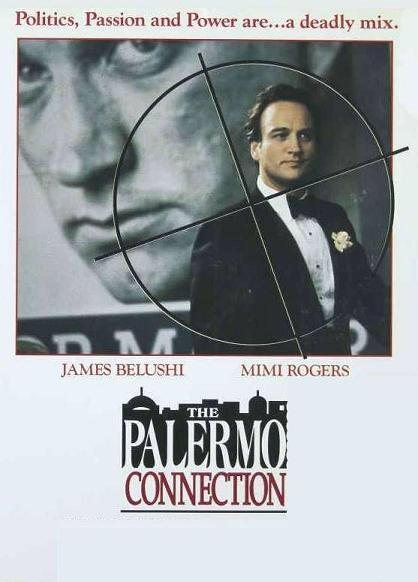 starring�James Belushi, Mimi Rogers.�An Italian-American politician, running for NYC mayor, decides to support the legalization of drugs to increase his chances of winning the election. James Belushi, Mimi Rogers, Joss Ackland. An Italian-American politician, running for NYC mayor, decides to support the legalization of drugs to increase his chances of winning the election. This politician (Belushi) and his new wife (Rogers) strategically choose Palermo, Sicily as the site of their honeymoon, in hopes of impressing voters. The candidate aimed to appear as a man who valued his family's roots in Sicily. Initially, his platform, marriage, and choice of Palermo as a honeymoon site improve his voter support. However, this brave candidate meets a strong force in Palermo - The Mafia - ready to destroy his legalization platform. The Mafia, which can not afford to lose control over the drug market, cleverly places him in a compromising position, forcing him to either drop his support for legalization or face serious consequences.